DIGITAL CADDIES IN COM USD0.001 (OTCMKTS:CADY) is set to continued its steady climb after several developments that have reshaped the company and has refocused its strategy setting it up for it to be a more nimble company and set to capture growth opportunities. Its local advertising program is poised to generate millions in revenues. CADY technology is fulfilling an interesting niche in the Golf Industry. It is a leader in on course delivery of technology services and content to golfers. DIGITAL CADDIES IN COM USD0.001 (OTCMKTS:CADY) provides unique access to golfers via an interactive tablet mounted in golf cars, serving up features golfers, course operators and advertisers want. Once a golf course is equipped with Digital Caddies’ touch-screen tablets, golfers enjoy a variety of useful applications and services, including GPS-based course navigation and aerial fairway and green views with accurate yardages to landmarks. CADY has been on a path to eliminating its debt to manageable levels. The company recently announced that it had settled a debt agreement with Sprint to significantly eliminate its debt that has been sapping the company’s ability to grow and innovate. The agreement with Sprint will allow Spring to acquire 19% equity stake in CADY. In other news, several other major creditors have entered into agreements with CADY to eliminate $7 million worth of obligations including Sprint. This will allow the company to focus on growth and revenue generating opportunities. To continue its product development, CADY released a major software update on its platform to reduce bandwidth and data consumption. Initial data points are showing a 90% improvement in data usage. CADY is using a cloud-based strategy to more quickly add new features, services, deployments, and updates. Most intriguing update is CADY announced a strategic partnership with Snapp Digital. Its strategic partner specializes in a cloud based content management system that allows publishers and advertisers to easily control content displayed on screens on a distributed digital out of home network. CADY is currently trading at a $3 million market valuation. The company has already eliminated much of its debt which will help refocus its strategy on exploring new revenue opportunities and growth versus servicing its debt. It has made several in-roads to generating new revenue streams from its local advertising program to its strategic alliance. 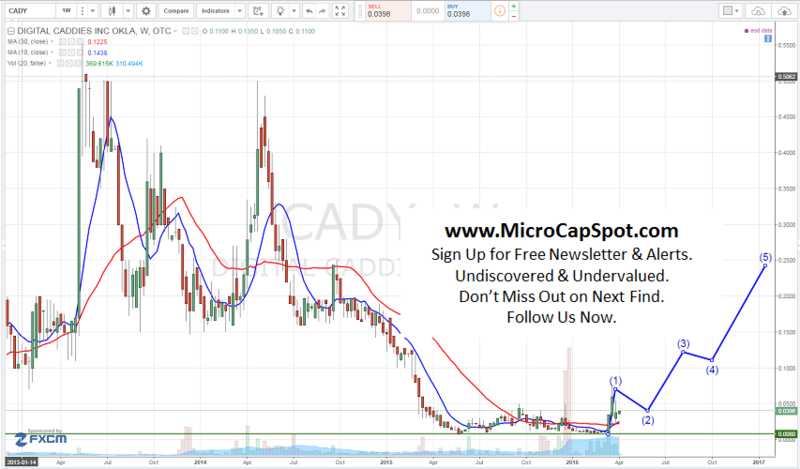 We will be updating on CADY when more details emerge so make sure you are subscribed to Microcapspot so you know what’s going on with CADY. Disclosure: we hold no position in CADY either long or short at the publication of this article.